In addition to the high admission standards for members, what makes Globalia Logistics Network (GLOBALIA) different is what we call "disciplined cooperation". Every member in our network has agreed to adhere to our rules, and to report any breaches of the said rules by other members to Globalia Head Office. Any member which fails to adhere to the rules is expelled from the network and replaced by the next best-qualified applicant on the waiting list for that territory. Members commit to safeguard the interests and reputation of GLOBALIA in their city by operating to the highest standards of professionalism including but not limited to integrity, quality and customer service. 1.1. The Agents shall actively co-operate in international freight forwarding and logistics services for shipments moving between their respective territories. Each member company will be responsible for the provision or arrangement of full logistical services necessary for the movement of freight, via air or ocean or any other means, including ancillary support services and timely preparation and transmission of related documentation and/or electronic data. Each member company will name the other as consignee on any Master Air Waybill, House Air Waybill, Master Ocean Bill of Lading or House Bill of Lading. The member companies agree not to accept co-load cargo from or on behalf of other freight forwarders without first gaining the permission of the other. The member companies agree that the extending of credit for any freight charge is solely the liability of the agent offering such credit. All requests for information will be actioned upon receipt by the agent. 1.2. Reporting violations: Members will inform the GLOBALIA organization when they become aware of or believe that fellow members are engaged in questionable business practices of any sort, including but not limited to charging significantly higher rates than the average market rates in their territories, providing a substandard service to their customers, or neglecting their responsibilities to other members. Members agree to transfer a growing percentage of their shipments to their fellow agents in the network. 2.1. Procedure for finding a member: To locate a member representing the network in a specific territory, enter the name of the pick-up or delivery city in the search box of the Agent Finder tool in the GLOBALIA Intranet. The company details and location of the closest members will appear, along with the distance in kilometres between the member company's location and the origin/destination of the shipment, and a map showing the two locations. Special Case: When a customer's contact person is in a location different from the city of pickup or delivery, preference will be given to the member at the location nearest to the contact person, with a view to future sales visits. 2.2. Verification of compliance: Members will provide evidence to demonstrate their cooperation with other member companies when requested to do so by the GLOBALIA Organisation. 2.3. Penalty for failure to comply: Members who have failed to transfer a growing percentage of their shipments to their fellow agents thus increasing cooperation, will be expelled from the network and replaced by the next best-qualified applicant on the waiting list for that territory. 2.4. Statistics: Twice annually, member companies will send the GLOBALIA Organization details of the number of shipments sent with details including but not limited to; number of TEUs and/or kilos, origins, destinations etc. The combined totals from members will be used by the GLOBALIA Organization as a basis for negotiating lower rates from carriers and insurers on their behalf. Members will provide the GLOBALIA Organization with a list of all their current local charges for departure/arrival of air/sea shipments, which will be posted on the password-protected GLOBALIA Intranet for other members to refer to when preparing quotations. 3.1. Contents: This list will include: Air import/export; FCL import/export; LCL import/export; THC; Port Taxes; Customs Clearance; Inlands to/from ports/airports. Members will keep these local rates and charges up to date at all times, and will accept normal shipments from other members based on these published rates. 3.2. Exception: Rates for large-volume and complex shipments may be negotiated between members. 3.3. Confidentiality: Rates published in the password-protected intranet by members are confidential and must not be disclosed to third parties. In the event of the disclosure of this information, the offending member will be expelled from the network. After checking that their city is OPEN in the Territories and Fees section of the GLOBALIA website, the freight forwarder wishing to join the network will complete and return the Membership Application form, including all the data and additional documents that may be specified. If selected as a potential member, the applicant will complete and return 1) the Membership Agreement (signed and stamped), and 2) the Local Charges form. 4.1.1. Verification: The GLOBALIA organisation may use the services of DUN AND BRADSTREET or other independent credit risk assessor to supply a financial report for the purpose of corroborating the financial data supplied by the applicant during the membership application process, and confirming that the applicant company is stable and solvent. A reasonable credit limit for each applicant will be proposed by the risk assessor. Should the applicant become a full member,this credit risk limit will be published on the GLOBALIA Intranet for other member companies and the GLOBALIA organization to view. The credit extended may only exceed the displayed limit when the two parties agree in writing, and under their own exclusive responsibility. Liquidity ratio = (A/B + C/D) / 2 = the result should be equal or superior to 1. (A = Current Assets YEAR-2 (includes cash, equivalents, accounts receivable, inventories, prepaid expenses). B = Current Liabilities YEAR-2 (includes bank loans and notes payable, long term debt due; 1 year, accounts payable, taxes payable, wages, salaries, bonuses payable). C = Current Assets YEAR-1 (includes cash, equivalents, accounts receivable, inventories, prepaid expenses). D = Current Liabilities YEAR-1 (includes bank loans and notes payable, long term debt due 1 year, accounts payable, taxes payable, wages, salaries, bonuses payable)). Gearing ratio = (A/B + C/D) / 2 = the result should be equal to or less than 2. (A = Medium and Long Term Debt YEAR-2 (Due 1 Year). B = Owners Equity YEAR-2 (Include shares/stock value, additional contributed capital, retained earnings and reserves). C = Medium and Long Term Debt YEAR-1 (Due; 1 Year). D = Owners Equity YEAR-1 (Include shares/stock value, additional contributed capital, retained earnings and reserves). 4.2.1. Notification: The GLOBALIA organization will make a decision on applications and inform the applicant in writing within 15 days of its decision. 4.2.2. Membership Agreement: If an application is approved, the GLOBALIA organization will notify the applicant by sending the Membership Agreement which the applicant will sign, stamp, and return. 4.2.3. Payment Protection Plan (PPP): The applicant should indicate whether or not he/she chooses to participate in the PPP in the space provided on the membership application form. 4.2.4. Admission: Once GLOBALIA receives the signed and stamped Membership Agreement, the GLOBALIA Organization will grant admittance to the new member which will thenceforth hold exclusive rights to operate as the GLOBALIA member in the city and/or territory assigned by GLOBALIA as long as it continues to meet its obligations set out in the Membership Agreement and Rules and Procedures. All existing members will be informed of the admission of the new member via an email announcement. 4.2.5. Listing: A profile of each member company will be published in the Agent Finder section of the password-protected GLOBALIA Intranet, and will be accessible to other network members only. This listing will include the member's trading name, location, contact details, bank details, local charges, and recommended credit risk limit, along with other pertinent information, such as any special capabilities or services offered. At the end of the membership term, members that decide to renew for a further 12 months should order a bank transfer to pay the full amount of the next year's membership fee. In the event they decide to join the Payment Protection Plan (PPP) for the same period as their membership, they must issue a separate transfer of 500 EUR in payment of the annual contribution to the PPP. 5.1. Membership fee amount: The annual membership fee differs between territories. To view the fee for each territory, agents should view the Territories and Fees section of the GLOBALIA website. Membership fees will be revised each year, but any increase will never be greater than 10% per annum. 5.2. Discounts for referrals: Members who refer other qualified freight forwarding agents who then successfully become members of GLOBALIA will receive a 25% discount on their next membership fee for every successful candidate up to a maximum of four per annum. To participate, visit the GLOBALIA intranet and download the Referral Program Form. 5.3. PPP contribution amount: The fee per annum for participation in the PPP is 500 EUR. This amount will be reviewed annually, but any increase will never be greater than 10% in a single year. Full details of the PPP are available on the GLOBALIA website under Payment Protection Plan. 5.4. Invoice and payment: Members will be invoiced for the Annual membership fee and PPP contributions 15 days prior to the end of the membership year, and payment by bank transfer will be due before the end of the membership year. Bank charges will be paid in full by the member. 5.5. 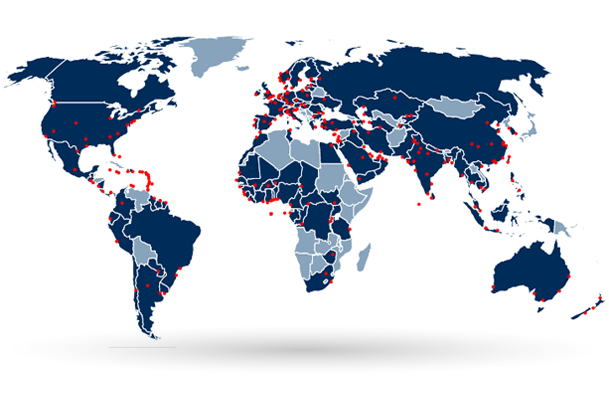 Branch offices: Members can add their branch offices in the same country as their Head Office membership. Each branch office that is added to the network, will pay only 50% of the specified membership fee for the territory and 500 EUR per annum from each branch office to the PPP. 5.6. Refunds: No refunds of membership fees or contributions to the PPP are available to a member who has outstanding payments and is in debt to other members. A member who freely resigns from the network will be refunded 80% of his contribution to the PPP for that year, less a proportion of any claims made against the fund. The resigning member will not receive a refund on the membership fee not even in part. In the event of a member's expulsion or resignation, no part of the annual membership fee will be refunded. Rule 6-A. RESIGNATION: A member choosing to resign from the network must inform the GLOBALIA Organization of this at least one month before the cessation of the membership year. 6-A.1. Late notice: If the member fails to give the written resignation within 30 days before the cessation of the membership year, the member will be required to pay the full membership fee. - 20% of this total, which will be retained by GLOBALIA to cover expenses anticipated to arise in respect of future claims, such as legal or debt collection costs. - The member's pro rata share of the total monies disbursed to meet claims made against the fund during the period of their membership. The refund --net of these two amounts-- will be made by bank transfer during the first quarter of the calendar year. Rule 6-B. EXPULSION: Members who are expelled for any of the reasons listed below are liable to forfeit all claims for refund of any part of membership fee and their contribution to the PPP fund. - Engaging in dubious business practices, rendering poor service, or neglecting responsibilities to other members. - Failure to seek cooperate with or request cooperation from other members. - Recurrent late payments of invoices issued by other members. - Failure to pay invoices issued by other members. - Failure to attend two consecutive annual conventions. - Failure to actively contribute to sales promotion. - Bad faith in a dispute with another member. - Recurrent violations of any other rules. The English language will be used in all business and organizational communications between members. Members will adhere to the following procedures in their e-mail communications with other members and with GLOBALIA Head Office. All members are obliged to contribute actively to sales promotion and coordination. 8.1. Sales leads: Members agree to provide continuous sales, including sales leads and reports and actively engage in mutual promotions of joint services within their respective territory. 8.2. Response time: A member should acknowledge receipt of a receiving a sales lead on the day it is received. No more than five working days later, the receiving member will contact the customer, visit the customer if necessary, and notify the sending member of the status of the sales lead. 8.3. Buying and selling rates: All Members are to actively pursue, investigate and negotiate the best possible net rates and will provide NET/NET buying rates and real selling rates to the other members. For the sake of transparency, at the request of members with whom they have cooperated in a transaction, the corresponding members will furnish copies of the respective invoices received from suppliers and sent to customers. 8.4. Quotations: All quotations must show: a) the prices offered by at least two different carriers in order to give the buyer a choice; b) the currency to be used; c) transit time; d) route; e) airline/shipping line. 8.4.1. Surcharges: Any applicable surcharges such as BAF, CAF, Fuel, Security, Congestion, War Risk, etc. will be those valid at the time of shipment. 8.4.2. Additional costs: Any additional costs there may be must be shown to the contracting party and approved by them. No member may charge for services not specified in the quotation or make extra charges that were not submitted in advance for the approval of the contracting party. 8.4.3. Quotation response time: Members will reply to requests for quotations received from other members in a timely manner. Any request received in the morning should be answered on the same day, and those received in the afternoon should be answered by the following morning at the latest. Special case 1: When the exact costs cannot be determined and/or when the shipment/s are complex, members should ask for an extension specifying a deadline of when they will submit the quotation. Special case 2: The maximum period for preparing a quotation for major tenders should never exceed ten working days. 8.5.1. FOB charge profits: will not be shared, but withheld by the shipper agent at origin. 8.5.2. Destination charge profits: will not be shared, but withheld by the consignee agent at destination. 8.5.4. Prepaid cargo: As a general rule members will not share profits earned from prepaid cargo. However, the destination member may handle the shipment and earn a profit by applying market rates to local delivery charges. If the cargo is prepaid but the shipment has been routed, then the destination member will be obliged to share the profit earned on the freight. 8.6. Selling Rates: The member coordinating the shipment shall have the final word on selling rates. Invoices for all shipments sent/received within a calendar month will be paid between the 12th and 15th day of the following month. Customs charges (VAT and other taxes) will be paid at the same time as the invoice/cash. 9.1. Means of payment: All invoice payments will be made by bank transfer. The member ordering the transfer should select 'SHA' when making the transfer, so that all bank fees are shared between both parties. 9.2. Advance notification: On the date the invoice is issued, an advance copy of the paper invoice will be sent by e-mail to the member being billed. The member receiving the invoice will reply acknowledging receipt of the invoice. 9.3. Dates: The dates shown on invoices must tally with the departure date for exports and the customs clearance date for imports. 9.4. Currency: The billed member must pay in the currency requested in the invoice. Only if agreed in advance, can the billed member pay in an alternate currency. 9.5. Statement of accounts: On the 5th day of the following month, a statement of accounts listing all invoices and credit notes for shipments among members within one month will be issued. 9.6. Confirmation: The member issued with the statement of accounts must confirm receipt between the 6th and 11th day of the month of receipt and request copies of any invoices not listed that should be. 9.7. Disputes: In the event of a dispute over an invoice, the billed agent must notify the issuer within 10 working days, clearly detailing the reason for the dispute. Any claim made after 10 working days will not be acknowledged. If, after 45 days, the dispute is still ongoing, the complainant should file a complaint to the Dispute Resolution Service. 9.8. Penalties: Any member who does not receive notification from a billed agent by the 16th day of the month following the invoice period, will notify the GLOBALIA organization of the incident. 9.8.1. Yellow: The first time a billed member fails to pay another members' invoice on time, this situation will be reflected in the billed member's Agent Profile in the Agent Finder tool into the GLOBALIA Intranet. A green traffic light symbol signifying "Safe Member" will be removed and replaced by a yellow traffic light signifying "Caution: 1 Delay". At this time, the member's payment terms will remain unchanged. 9.8.2. Orange: A member that fails to pay within five days of the deadline, or if the member misses a payment deadline for a second time, the symbol on the member's Agent Profile listing will be changed to an orange traffic light signifying "Penalized Member". The agent will then be obliged to make all future payments to members in cash and prior to the release of shipping documents. The extension of this penalty will be determined by the GLOBALIA Organization, but will not exceed six months. 9.8.3. Red: If the offending agent fails to pay the debt within the extension period of five days, the GLOBALIA Organization will activate the red "Blocked Member" alarm, changing the symbol on the member's Agent Profile listing to a red traffic light. All members will be advised by the GLOBALIA Organisation to not engage in any further transactions with the offender. However, if the blocked member (under red light conditions) makes the payment of the outstanding amount within 10 days, the GLOBALIA Organization will raise the status from red to orange for a minimum period of one year. 9.8.4. Expulsion: The blocked member who fails to pay the debt within the 10 days will be expelled from the network and the GLOBALIA Organization will envoke the following action. - Instruct all members to withhold all payments, and request information from all members regarding their accounts with the offender. - Release funds from the PPP to hire legal services in the offender's home country to collect the debt. * Persons representing other freight forwarders and carriers who acted as the offender's referees during the application process. * IATA, FIATA, Custom Broker Association, and the freight forwarders association in the offender's home country. If a dispute over an invoice cannot be solved amicably within 45 days, the complainant must inform the GLOBALIA Organisation who will then act as the neutral Dispute Resolution Service, under the terms and conditions established and agreed by all members. 10.1. Agreement to accept resolution: Members who voluntarily partake in the Dispute Resolution Service agree to accept and abide by the decision of GLOBALIA Head Office and refrain from any further action relating to the dispute. 10.2. Fee: GLOBALIA will charge a minimum of 500 EUR for the use of its Dispute Resolution Service, the payment of which will be shared equally by the disputing members. A higher fee will be charged if the services of an attorney, expert witness, or consultant are required. Prior to arbitration, each of the members involved will receive an invoice from GLOBALIA for 250 EUR to be paid by bank transfer. 10.3. Background: Each disputing member will send an e-mail to GLOBALIA Head Office with details of the reasons of the dispute, along with all supporting evidence. 10.4. Decision: GLOBALIA Head Office will reach a decision on the dispute and will notify the parties involved within 20 working days of receipt of the last of the relevant documents. 10.5. Implementation: The two disputing parties will implement the decision reached by GLOBALIA Head Office within five business days of being advised. 10.6. Bad faith: GLOBALIA reserves the right to expel any member that is found to have acted in bad faith in the course of a dispute. 10.7. Debts: GLOBALIA will not collect debts on behalf of its members, but it will punish or expel members who fail to meet their obligations to other members. While it carefully screens applicants to ensure that only the most reputable firms are admitted to the network, GLOBALIA will accept no responsibility for any unpaid debts between members. A member must send a principal or an executive member of staff to the GLOBALIA annual meeting. Members must pay the registration fee in advance, and pay their own travel and lodging expenses. 11.1. Exceptions: Any member who is unable to attend must submit proof of extenuating circumstances justifying their inability to attend to GLOBALIA Head Office at least 30 days before the convention. Please note; conflicting commitments such as trips or meetings, or the inability to obtain a valid travel visa in time, will not be considered a valid reason to not attend. 11.2. Penalties: Members who fail to attend the conference without a valid excuse (see 11.1., above) will pay GLOBALIA a penalty of 1,000 EUR. Members who fail to attend two consecutive conventions without a valid excuse will be expelled from the network. The GLOBALIA logo will be displayed by members along with their own company logo in communications with customers, suppliers and the public in general, both to indicate their membership of the network and to promote the brand. 12.1. The Globalia logo: Members will display the GLOBALIA logo on their business cards, e-mail auto-signatures, websites, advertising brochures, invoices, faxes, company vehicles, signs, etc. 12.2. The Globalia website link: he GLOBALIA website link www.globalialogisticsnetwork.com and logo will be displayed on the member's website. 12.3. The Globalia brand manual: Members will adhere to the practices outlined in the Brand Manual in the GLOBALIA Intranet when using the GLOBALIA logo and other graphic material. 12.4. Refraining from use: Any freight forwarding company which either leaves GLOBALIA voluntarily or is expelled will thereafter desist in using the GLOBALIA trade name, brand, logo, and/or other network graphic materials. The GLOBALIA Head Office team will assist its members in promoting and strengthening the GLOBALIA brand image to their own advantage and that of all other members. 13.1. Member news: GLOBALIA encourages members to send company news items to the network's PR Coordinator for publication on the GLOBALIA website. 13.2. Press cuttings: Members will make copies of news items published on the basis of their own press releases and send them to the GLOBALIA PR Coordinator for distribution within the network.